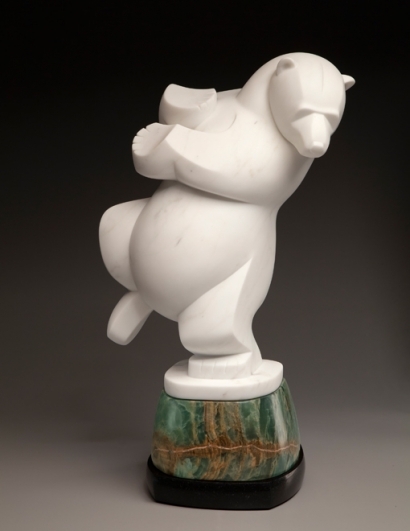 “Dancing On Thin Ice” is my first stone sculpture of a bear, any bear. There are an abundance of sculptures of bears, so I thought I didn’t need to create another. I was wrong—I love polar bears, and I hate what is happening to them, and to their Arctic habitat. I have the need to speak for them, and ultimately for us, through my art. -Polar bears are almost completely covered with thick fur. -Polar bears are one of the fattest mammals on earth, and have a 4-inch thick layer of insulating fat under their enormous coats. -Polar bears have an extraordinary sense of smell, 100 times more sensitive than that of humans. In fact, polar bears can smell a seal carcass 20 miles away buried under 3 feet of snow. -Polar bear paws measure up to 12 inches in diameter. They function like snowshoes to evenly distribute the bear’s weight so it won’t sink in deep snow. -They have small bumps on their foot pads that grip the ice so they don’t slip. -Polar bears slither across thin ice on their tummies, thus spreading out their weight even more, to avoid breaking through the ice. -To build a den, polar bears dig a shallow depression in the snow and then wait for snow to fall and bury them, providing insulation while they hibernate. -Females give birth to their cubs while in hibernation. Polar bears are burning more energy to find less food. Starving. Polar bears eat mostly seals, which they catch by waiting for them at seal breathing holes in the Arctic sea ice. This is the most successful hunting technique for them because they burn the fewest calories in the effort to eat more calories. Polar bears burn 12,300 calories per day and must eat a seal every 4 days. Walking to hunt burns a lot of calories, and swimming to find sea ice burns even more calories. Arctic sea ice is forming later and later in the fall and melting earlier and earlier in the spring due to global warming. No sea ice, no breathing holes for seals, no food for polar bears. Today there is far less sea ice total even in the depths of winter, so polar bears must swim enormous distances to reach the sea ice. There are 770,000 square miles less sea ice than the average sea ice coverage from 1981 to 2010. This is the size of the states of Alaska and California combined. We humans, the dominant species on the planet, need to address global warming. We need to go green and stop burning fossil fuels. Otherwise, we will lose a lot more than our beloved polar bears.